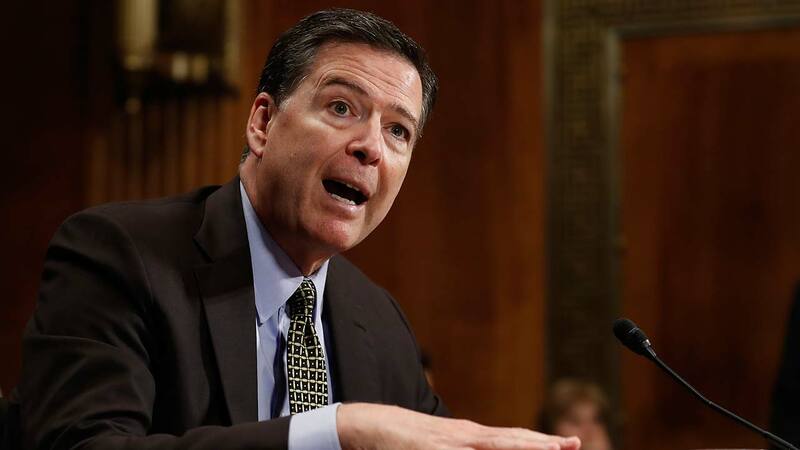 WASHINGTON (WABC) -- Deputy Attorney General Rod Rosenstein outlined in detail in a three-page memorandum the official reasons for James Comey's firing. The Federal Bureau of Investigation has long been regarded as our nation's premier federal investigative agency. Over the past year, however, the FBI's reputation and credibility have suffered substantial damage, and it has affected the entire Department of Justice. That is deeply troubling to many Department employees and veterans, legislators and citizens. The current FBI Director is an articulate and persuasive speaker about leadership and the immutable principles of the Department of Justice. He deserves our appreciation for his public service. As you and I have discussed, however, I cannot defend the Director's handling of the conclusion of the investigation of Secretary Clinton's emails, and I do not understand his refusal to accept the nearly universal judgment that he was mistaken. Almost everyone agrees that the Director made serious mistakes; it is one of the few issues that unites people of diverse perspectives. The Director was wrong to usurp the Attorney General's authority on July 5, 2016, and announce his conclusion that the case should be closed without prosecution. It is not the function of the Director to make such an announcement. At most, the Director should have said the FBI had completed its investigation and presented its findings to federal prosecutors. The Director now defends his decision by asserting that he believed Attorney General Loretta had a conflict. But the FBI Director is never empowered to supplant federal prosecutors and assume command of the Justice Department. There is a well-established process for other officials to step in when a conflict requires the recusal of the Attorney General. On July 5, however, the Director announced his own conclusions about the nation's most sensitive criminal investigation, without the authorization of duly appointed Justice Department leaders. In response to skeptical questions at a congressional hearing, the Director defended his remarks by saying that his "goal was to say what is true. What did we do, what did we find, what do we think about it." But the goal of a federal criminal investigation is not to announce our thoughts at a press conference. Tito goal is to determine whether there is sufficient evidence to justify a federal criminal prosecution, then allow a federal prosecutor who exercises authority delegated by the Attorney General to make a prosecutorial decision, and then if prosecution is warranted - let the judge and jury determine the facts. We sometimes release information about closed investigations in appropriate ways, but the FBI does not do it sua sponte. Concerning his letter to the Congress on October 28, 2016, the Director cast his decision as a choice between whether he would "speak" about the decision to investigate the newly-discovered email messages or "conceal" it. "Conceal" is a loaded term that misstates the issue. When federal agents and prosecutors quietly open a criminal investigation, we are not concealing anything; we are simply following the longstanding policy that we refrain from publicizing non-public information. In that context, silence is not concealment. My perspective on these issues is shared by former Attorneys General and Deputy Attorneys General from different eras and both political parties. Judge Laurence Silberman, who served as Deputy Attorney General under President Ford, wrote that "it is not the bureau's responsibility to opine on whether a matter should be prosecuted." Silbertnan believes that the Director's "performance was so inappropriate for an FBI director that (he) doubt(s) the bureau will ever completely recover." Jamie Gorelick, Deputy Attorney General under President Clinton, joined with Larry Thompson, Deputy Attorney General under President George W. Bush, to opine that the Director had "chosen personally to restrike the balance between transparency and fairness, departing from the department's traditions." They concluded that the Director violated his obligation to "preserve, protect and defend" the traditions of the Department and the FBI. Former Attorney General Michael Mukasey, who served under President George W. Bush, observed that the Director stepped way outside his job in disclosing the recommendation in that fashion" because the FBI director doesn't make that decision." Alberto Gonzales, who also served as Attorney General under President George W. Bush, called the decision "an error in judgment." Eric Holder, who served as Deputy Attorney General under President Clinton and Attorney General under President Obama, said that the Director's decision "was incorrect. It violated long-standing Justice Department policies and traditions. And it ran counter to guidance that I put in place four years ago laying out the proper way to conduct investigations during an election season." Holder concluded that the Director "broke with these fundamental principles" and "negatively affected public trust in both the Justice Department and the FBI. Former Deputy Attorneys General Gorelick and Thompson described the unusual events as "real-time, raw-take transparency taken to its illogical limit, a kind of reality TV of federal criminal investigation," that is "antithetical to the interests of justice." Donald Ayer, who served as Deputy Attorney General under President George HW. Bush, along with other former Justice Department officials, was "astonished and perplexed" By the decision to "break with longstanding practices followed by officials of both parties during past elections." Ayer's letter noted, "Perhaps most troubling is the precedent set by this departure from the Department's widely-respected, non-partisan traditions." Although the President has the power to remove an FBI director, the decision should not be taken I agree with the nearly unanimous opinions of former Department officials. The way the Director handled the conclusion of the email investigation was wrong. As a result, the FBI is unlikely to regain public and congressional trust until it has a Director who understands the gravity of the mistakes and pledges never to repeat them. Having refused to admit his errors, the Director cannot be expected to implement the necessary corrective actions.